Ruffled Custard Glass Pitcher, Bargain Shack offers Boyd Glass, Mosser Glass, L.G. Wright, and Contemporary Collectible Glass including Vaseline Glass - J.B. Scottie Dogs, Pooche, Animal Covered Nests, Toothpick Holders, Salts, Glass Animal Figurines, Clowns, Dolls, Slippers, Vehicles, and More! This custard pitcher from L.G. Wright stands 5-1/2" tall. The elegant ruffled top is complemented by that wonderful ribbed handle. Custard glass also glows under a black light! 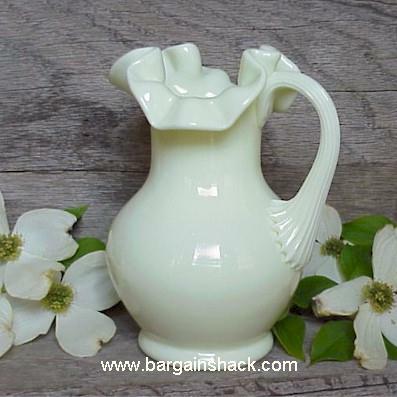 If you love custard glass or like to collect small pitchers then this is a must have for your collection! L.G. Wright had several prominent glass factories produce their glass and the look and feel of this piece sure reminds me of Fenton. L.G. Wright closed up shop in 1999 and this is an original piece from their factory auction.